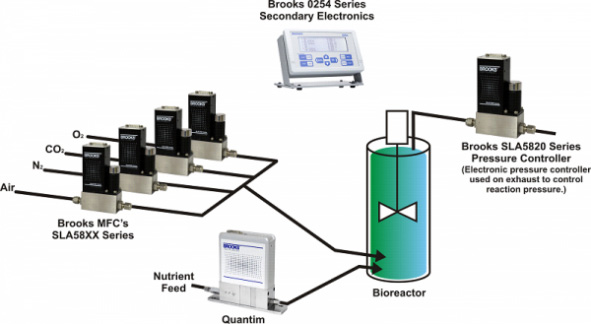 Gas pressure control is critical in many applications like life sciences and chemical/petrochemical research where flow is an integral part of the process. Brooks Instrument electronic pressure controllers can be used as they require flow to function. Compared to using a mechanical pressure regulator, electronic pressure controllers eliminate droop, boost and hysteresis, offering stable pressure control. There are two configurations available for pressure control - upstream and downstream. This terminology is somewhat unique to Brooks Instrument electronic pressure controllers. 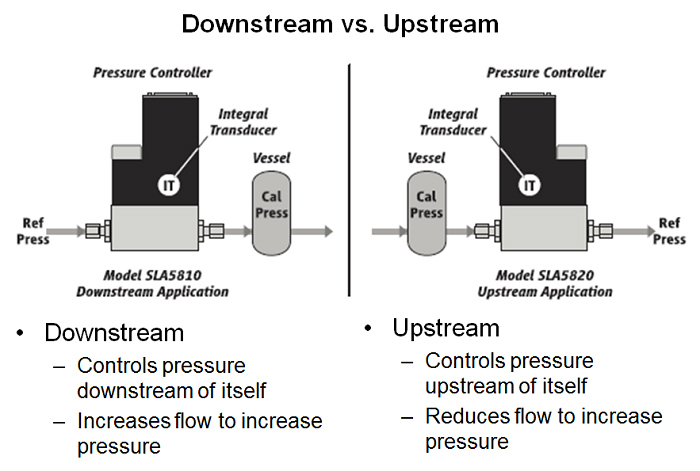 Downstream vs. Upstream Pressure Control Downstream pressure controllers maintain the pressure downstream of the device itself, increasing flow to increase the pressure and decreasing flow to decrease the pressure. For this reason, this is called direct acting. This configuration is commonly called a standard pressure regulator. A downstream pressure controller acts very similar to a typical mass flow controller because they are both direct acting. Upstream pressure controllers maintain the pressure upstream of the device itself, increasing flow to reduce the pressure and decreasing flow to increase the pressure. For this reason, this is called reverse acting. This configuration is commonly called a back pressure regulator in the industry. Selecting and Sizing an Electronic Pressure Controller The following information is required to select and size a Brooks Instrument electronic pressure controller: 1. Process gas 2. Maximum flow rate being used to maintain pressure -The "sweet spot" for pressure control is between 100 SCCM and 5 SLPM. 3. Calibration pressure (maximum pressure to be controlled) 4. Reference pressure (for upstream controllers the reference pressure is the downstream pressure and for downstream controllers the reference pressure is the upstream pressure) As long as flow is present in a process you will typically find the need for some type of pressure control. Vessel sizes up to 30 liters commonly use flow rates up to 3 SLPM during their process steps. Brooks Instrument pressure controllers are a perfect fit for these services, offering stable pressure control with no droop, boost or hysteresis, which are commonly experienced when using a mechanical pressure regulator.